Let others feel happy as you deliver them this Exquisite Festive Favorite Sweets N Chocolate Gift Hamper with your love and affection. This fantastically designed Gift Hamper is laden with Haldirams Soan Papdi (250 gr. 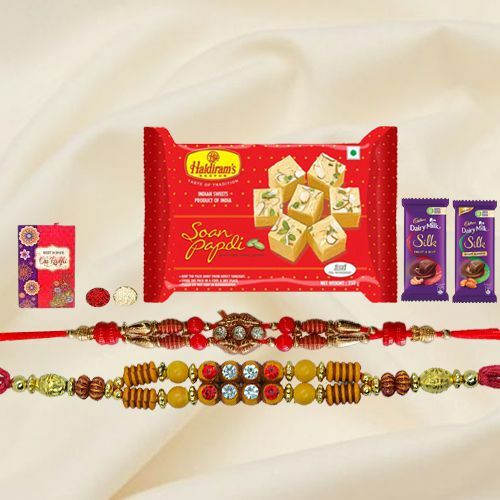 ), Cadbury Dairy Milk Fruit and Nut Chocolate Bar and Cadbury Dairy Milk Roast Almond Chocolate Bar with Two Rakhis With Free Rakhi Card and Roli Tilak Chawal. Haldirams Soan Papdi (250 gr. ), Cadbury Dairy Milk Fruit and Nut Chocolate Bar and Cadbury Dairy Milk Roast Almond Chocolate Bar with Two Rakhis With Free Rakhi Card and Roli Tilak Chawal. Haldirams Soan Papdi (250 gr. ), Cadbury Dairy Milk Fruit and Nut Chocolate Bar and Cadbury Dairy Milk Roast Almond Chocolate Bar with Bhaiya Bhabhi Rakhi and Roli Tilak Chawal. Haldirams Soan Papdi (250 gr. ), Cadbury Dairy Milk Fruit and Nut Chocolate Bar and Cadbury Dairy Milk Roast Almond Chocolate Bar with Family Rakhi Set and Roli Tilak Chawal.